I have noticed a trend in my years on the net and dealing with a multitude of people and would just like to give you some friendly advice. Don't be one of the ones that complains about something and then uses that as an excuse for not being successful. I have seen so many folks excuse their way right into failure. In my experience excuses are simply a fear response against taking risks. Take the risk. Quit complaining. The most successful people also are the ones that make the least amount of excuses and take the most risks. I'm not talking about unnecessary risks that is foolhardy. I'm talking about calculated risks. Leaping without looking is a bad policy and will most likely get your head smashed. Look before you leap, but STILL LEAP! Don't be afraid to take some risks. Don't be afraid to step out of your comfort zone and try something new. Will all risk lead to success. A big no to that one, but many will be rewarding and all will be a lesson learned. 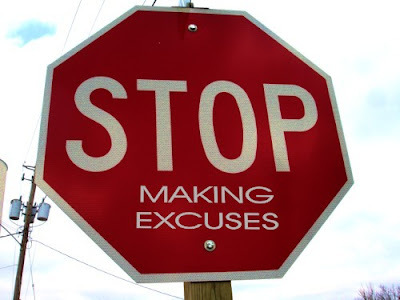 Excuses bring about inaction. Excuses hinder. I challenge you today, and over the weekend, to take some risks. Do something you are not comfortable doing. Step out of your comfort zone for a bit. You will find that the reward will be liberating.